Of all the areas in north and central India which are still home to the Royal Bengal Tiger, Ranthambore National Park is the most conveniently located in terms of its proximity to other places of interest (3 hours from Jaipur, 6 hours from Agra) making it an ideal place to try your luck spotting India’s King of the Jungle. Due to its popularity and the large numbers of visitors to the Park in the winter season, entry to Ranthambore is strictly controlled and only a set number of jeeps may enter the Park each morning and evening. Safaris by shared jeep (with naturalist and a maximum of 5 passengers) start from your hotel, and all jeeps congregate at the gates prior to the Park opening (hours vary with the season). Jeeps are allocated an area of the Park which they are allowed to visit (this is done by drawing of lots) and the safari will last around 2 hours. Drivers are in radio contact to enable the best chance of a sighting (particularly of tigers) being shared. The trails are bumpy and can be dusty, and it is really quite cold in the early hours of the morning in winter - come prepared with a jacket and hat. 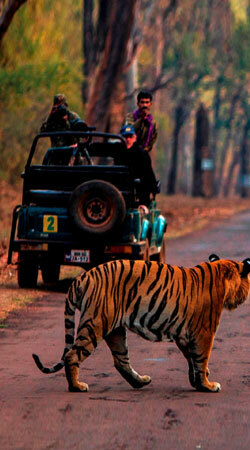 The wildlife of Ranthambore is plentiful and very varied. Aside from tigers, there are sloth bears, leopards, nilgai, spotted and barking deer, langur and macaque monkeys, crocodiles and a vast array of bird species.